The 2019 NHL All-Star Weekend will have fans and the players talking for quite some time. Over two days, the game’s best put on a stellar show in the Golden State, bringing the appreciative crowd at SAP Center in San Jose to its feet countless times throughout the All-Star Skills Competition and All-Star Game. It was Sidney Crosby who sparked the Metropolitan Division to victory in the All-Star Game final, a 10-5 win over the Central. The three-time Ted Lindsay Award recipient was named the Tournament MVP for his impressive performance. But it was far from the only highlight this weekend. The puck dropped on the weekend's festivities with the players making some serious fashion statements as they walked the red carpet. Teammates (Toronto Maple Leafs John Tavares and Auston Matthews), old friends (Ryan O’Reilly and Jack Eichel) and even mascots (yes, Gritty got into the action) enjoyed some picture-perfect moments before the participants strapped on their skates and prepared to bring their bag of tricks – and talents – to the All-Star Skills Competition. Thank you for your service! The United Heroes League (UHL) and the NHLPA, through their All-Star Hero campaign, which recognizes military personnel and their families for their services through the players’ NHLPA Goals & Dreams fund, welcomed Sergeant Richard Silva, Lieutenant Colonel Darrin. J. Janisch, Sergeant Michael Brewer, and Master Corporal Stephen Giza to NHL All-Star Weekend. The four service members were selected by the UHL after the public was asked to nominate their military hero. The winners, who received air travel and tickets to attend the 2019 All-Star Weekend with a guest, had the chance to get up-close and personal with their favourite players, while also taking home some sweet memorabilia. Read more about their inspiring stories on NHLPA.com. The stars of today might have the stars of tomorrow following in their foot skatesteps. Several all-stars gave their kids a taste of the San Jose spotlight over the weekend, including Stanley Cup champ Kris Letang, who shared a front-row seat with his son Alexander at the All-Star Skills Competition. Brent Burns gave a young fan an up-close and personal, out-of-this-world VR experience, much to the delight of onlookers. The charismatic d-man received an A-plus from a Sharks supporter, who got a real life surprise he won’t soon forget. How do you win and lose a friendly wager at the same time? David Pastrnak found that out when he and New York Islanders forward Mathew Barzal made a bet over dinner. At stake: if either player won their respective Skills competition, the duo would share the money. Pastrnak received $25,000 for his win (see below), while Barzal, who was third in the fastest skater event, still came out a winner. This year’s skills competition had a little bit of everything, from jaw-dropping moves, to a trailblazer with blazing speed, to a heartfelt gesture. With a time of 13.378, reigning Ted Lindsay Award winner Connor McDavid, sporting a new haircut, netted the hat trick in the fastest skater competition, becoming the first player to win the event three times. The Edmonton captain was far from the only one wowed by the effort of one entrant in particular, namely, Kendall Coyne Schofield (14.346), who became the first woman to compete in the NHL Skills Competition. The Team USA forward won gold at the 2018 Winter Olympics. Leon Draisaitl couldn’t pass up winning the passing challenge with a time of 1.09, while Johnny Gaudreau was well in control in the puck control relay, clocking in at 27.045. While David Pastrnak netted the accuracy competition by hitting five targets in 11.3 seconds, Auston Matthews also earned a rousing ovation… despite finishing last. The Maple Leafs star took off his Toronto sweater to reveal a Patrick Marleau all-star sweater, a tribute to his beloved teammate that didn’t go unnoticed by the future Hall of Famer and his wife. The popular hardest shot competition brought out the best big-time blasts from John Carlson, Steven Stamkos, Brent Burns and Seth Jones. Carlson’s 102.8 mph cannon gave him the win and kept it in the family, so to speak. His Washington teammate, Alex Ovechkin, won the competition last year. Future Hall of Fame backstopper Henrik Lundqvist ruled the cage in the only goaltending challenge, the Save Streak. The New York Rangers goaltender recorded 12 consecutive saves, in what was his fifth All-Star appearance. Did we mention the suit he wore to All-Star Weekend had The Godfather lining and quotes from the movie? Well played, King. Well played. 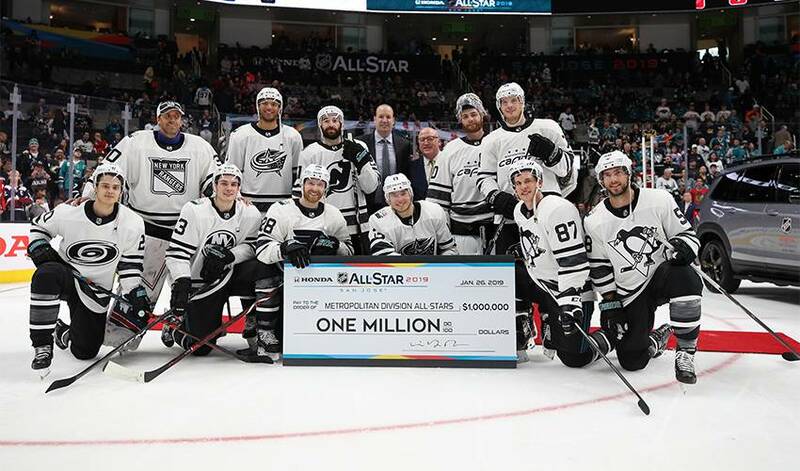 For the fourth consecutive year, the NHL All-Star game featured a 3-on-3 format with players from each division filling out the rosters with a grand total prize of $1 million. The action got underway with the Central Division taking on the Pacific Division. It was a one-two Colorado punch to start the scoring, as Mikko Rantanen lit the lamp 1:03 into the game. Thirty seconds later, Avalanche teammate Gabriel Landeskog pushed the Central lead to 2-0, as his squad cruised to a 10-4 triumph. Landeskog finished the contest with a hat trick and a helper (Ryan O’Reilly had a goal and three assists for the winners), while Avs teammate Nathan MacKinnon (unable to play due to injury) cheered on as part of the Central coaching staff. The second showdown featured the Atlantic and Metropolitan divisions, in a see-saw contest that ended with the Metropolitan squad scoring the final four goals en route to a 7-4 victory. Sidney Crosby and Seth Jones each had two goals for the winning side, while their all-star teammates Cam Atkinson and Kris Letang both notched a goal and an assist. John Tavares had a goal and an assist in a losing cause. It set the stage for a Central versus Metropolitan final. The Metropolitan side, who had goals from five different players in the first 10-minute period, went on to post a convincing 10-5 win against their Central rivals. Sidney Crosby and Mathew Barzal each had a tally and two assists in the first frame, while Henrik Lundqvist kept the Central players off the scoresheet heading into the final period. In what was a wide-open second period, Cam Atkinson recorded two goals and a helper for the winning division, while Crosby and Barzal each added to their impressive point totals with a goal and an assist. Time to mark your calendars. Next year’s NHL All-Star Game will take place in St. Louis, from January 24-26, 2020.